Here we are again at that time where two teams (who of course I don’t know the names of) are going to battle it out for the title of “Best Football Team in America” otherwise known as the Super Bowl….Superbowl, is it one word or two? I never know. What I do know is that there will be tasty food, naughty food & at least one Buffalo-something-kinda-food, and lots of it…Love it!! I will get to make a few dishes to contribute…other that that I won’t pay attention to much. For me it’s an excuse to hang out with friends and family, an excuse make & eat fun food? Soooo, I’m in!! Even if I don’t know or care lol what a right or left wing thing-a-ma-dude does. Here is a play on Nachos, however instead of chips…Po-ta-toes! That’s my Irish coming out! See that skillet…it’s about 100 old, if this photo was from then…it would look something like this, lol! I for one like to see food in color!! Have fun this weekend, be safe and tell me what you favorite bite of Superbowl food was! ** While your potatoes are boiling or baking, cook your beef in a small skillet, seasoning it with some salt & pepper until just cooked through. Also make your sour cream mixture by combining sour cream, Ranch & Cajun seasoning. Mix until combined. Place your potato slices in a pot of salted boiling water and boil for 6 minutes. Drain and blot dry. Preheat your oven to 400 degrees and oil a baking sheet with a bit of olive oil. Season your potato slices with salt and pepper and place them on your baking sheet. Bake for 8 minutes, then gently flip them over and bake another 6-10 minutes until done and beginning to crisp. Gently remove from your baking sheet and arrange your skins in an oven safe frying pan or cast iron skillet. Cover with your chosen cheeses and return to your oven (or broiler) until your cheese melts. 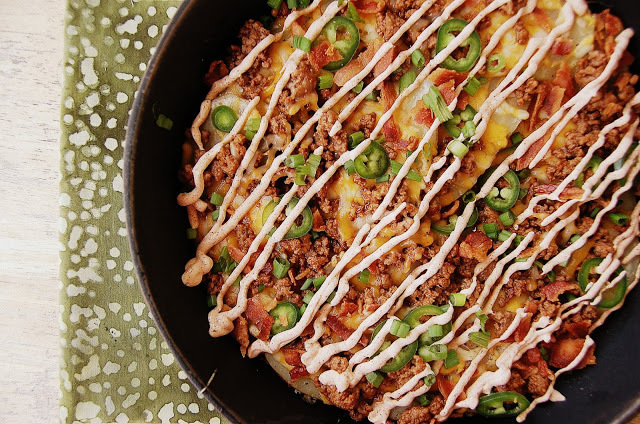 Scatter your ground beef, scallions, jalapenos and bacon over top. Place your sour cream mixture in a baggie, snip off a bit of one corner and drizzle over top. Serve right away. As long as your potatoes were BIG, this will serve 4-6 as an app. I am going to have to try these for our next get together!